Announcing Alaska Gold Brand seafood as our latest sponsor. We’re crazy about salmon in this house. Danny smokes a side of salmon nearly every week, which we eat as an appetizer for dinner with the kids. We pack smoked salmon in Lucy’s lunches and feed it to Desmond nearly every day. We also smoke black cod for Sunday morning bagels. (New York-style gluten-free bagels? Yes. The recipes is in our next cookbook, Gluten-Free Girl: American Classics Reinvented .) Now that it’s May, we’re eating as much halibut as we can afford. No food makes me feel so healthy and contented as wild Alaskan seafood. Still, we rarely offer seafood recipes on this site. We know that we’re lucky to live in the Pacific Northwest, with such easy access to great seafood. (We have a fish stand on the side of the road on Vashon, a family full of fishermen selling directly to those of us who live here.) We hesitate to put up recipes you can’t make easily. That’s why we’re so happy to announce Alaska Gold Brand (by Seafood Producers Cooperative) as our latest sponsor. Seafood Producers Cooperative is a band of fishing families who provide fantastic seafood direct to restaurants around the world. As they write: “70 years ago, a group of Alaskan halibut fishermen realized that the best way to ensure that their products were delivered with quality from ocean to market was to process their own fish instead of depending on the services of agents and distributors. They formed what would become North America’s oldest and most successful fishermen’s cooperative. Just recently, the folks at Seafood Producers Cooperative decided to start an online business, selling directly to consumers. This is Alaska Gold Brand. Danny and I have tasted some fine seafood in our lives together. This is some of the best. You can buy king salmon and coho salmon, in 5-pound and 10-pound packages, the fish already cleaned and portioned, then packed in vacuum-sealed packages. (I’m lucky that Danny loves to debone fish. Not everyone does.) Thaw the fish, open the package, and start cooking. Or, you could buy an entire salmon, if you like to clean the fish yourselves, like Danny. Alaska Gold sells sashimi-grade albacore and albacore in cans. (This is tuna you can trust. And delicious.) They sell beautiful halibut and black cod. And they have a loyalty program, where you get incredible fish every month. We can not tell you this with enough emphasis: this is some of the best fish you will ever eat. We’re big fans of Alaska Gold Brand, and we’re so happy they are sponsors so we can share them with you. Kendall Whitney, the marketing manager for Alaska Gold, gave us some thoughtful answers to our questions. Where do your fishermen catch their fish? The majority of our salmon (king, coho and keta) are harvested in the waters of Southeast Alaska, along with our halibut, sablefish (black cod), ling cod and rockfish. We have a number of members who catch albacore tuna off the coasts of Washington and Oregon. Members catch our California Gold king salmon off the coast of Northern California. What would you like people to know about seafood? Over the past two decades, per capita consumption of seafood products in the United States has ranged from a low of 14.6 pounds per person in 1997 to a record high of 16.6 pounds in 2004, Whitney notes. Since 2004, U.S. annual consumption of fish and shellfish has gradually decreased, to 14.5 pounds per person in 2013. For comparison, U.S. annual per capita consumption of other major food commodities is: red meats, about 110 pounds; poultry, nearly 75 pounds; dairy products, over 600 pounds; vegetables, over 400 pounds; fruits, over 250 pounds; flour and cereal products, almost 200 pounds. While seafood, like salmon, is a great source of Omega-3s — which have been shown to be both heart- and brain-healthy — our consumption of fish is relatively low. Most of what we get is imported, and a lot of that is caught illegally and/or mislabeled, of poor quality and not from sustainable fisheries. This is a shame, because Alaska is one of the premier fisheries in the world and is a pioneer in sustainability. We believe that the low seafood consumption here is due to misunderstanding of seafood and how to prepare it. Why is the idea of a fisherman’s cooperative so important to your fishermen? In a nutshell, a fisherman will get the fairest price when he or she delivers to the co-op — which is the fishermen’s own organization. It is very rare that fishermen can concentrate both on fishing and on selling their product, and do both jobs well. Working with a co-op that processes, packages and sells the fish allows members to share the costs and maximize the dollars that end up in the fisherman’s pocket. A co-op also maximizes returns on fishermen’s catches vs. what they’d make on their own. By joining forces in a co-op, fishermen lower their processing costs and ensure access to a much larger market than they would on their own. Here, members of the Halvorsen family fish for albacore tuna. Fishermen who sell on their own face three problems: Who will process and package the fish? How will they produce the volume needed to assure customers of a reliable supply? How can they get enough money to solve the first two problems? This is where a fishermen’s co-op comes in. A co-op allows fishermen to do what they do best: catch fish. A co-op can invest in processing and packaging facilities. A co-op can achieve enough scale so that customers don’t “run dry.” A co-op provides a safety net by allowing members to pool together and negotiate for better prices for common needs, such as vessel insurance and fishing gear. Co-ops have a unique way of doing business that offers fishermen the best of both worlds, giving them the opportunity to work independently while also providing a space to pull their resources together to achieve bigger goals. At the end of the day, the reason we have members who enthusiastically join the co-op is that their fish reaches a larger market than it would if they were working on their own. They get the fairest price for their hard work. How do your fishermen work to maintain sustainability of the fish? Our members fish using hook-and-line methods, which minimize the “by-catch” (the catching of non-target fish species or sizes). Hook-and-line methods are the opposite of mass extraction methods — there is a tremendous amount of respect for the fish when the fisherman handles one fish at a time. As a result, we produce a quality product using more sustainable methods. Our fishermen/members are examples of what Dan Barber writes about in Third Plate: Field Notes on the Future of Food: “Wild fish did not come into this world just to be our food,” Barber writes. “They came into this world to pursue their own individual destinies. If we hunt them and eat them, we must hunt them with care and eat them with the fullness of our appreciation.” Our members’ use of traditional hook-and-line methods respects the quality and uniqueness of each fish. Our motto is: One Hook, One Fish at a Time. This means that we catch, process and put the fish on ice within minutes of being caught. Once you see our fishermen in action and taste the results of a line-caught salmon from SPC, we think you’ll be hooked. Alaska is a world leader in sustainable fisheries. Maintaining sustainable fisheries is even written into the state constitution. The Alaska fisheries within which our members fish are carefully managed by biologists so that our members’ grandchildren can fish the same way that we do. That, to us, is the definition of sustainability. At the heart of everything we do is the overriding concern for “maintaining a top-quality product, from ocean to market.” Quality is the keystone of our mission. As you can see, Alaska Gold is an incredible, thoughtful company. We’re honored to be working with them. Alaska Gold is generously offering 5 pounds of their excellent Coho salmon to 3 readers of this site. Please leave a comment about why you would be interested in winning salmon from this company to enter. We will choose winners at random on Friday, May 22nd. Winners will be notified by email. Would love to try ALaska Gold salmon. We cannot purchase any like this in the south. My son loves salmon! He thinks it is great camping food. We’ve been moving towards a healthier lifestyle over the past few years – but I’ve not gotten to the point where I’ve added as much fish to our diets as we should – this sounds like a good opportunity! Thanks! I love to serve fish because it’s healthy, but mostly because we love the taste! Love halibut!! But there are limited places to buy good fish in my area. Wow- I’d love to win salmon because it’s the most delicious food and I can’t afford to buy it much. I just have to drool over it in the store. 🙂 We have friends who lived in Alaska and taught us how to grill salmon the right way. Melt in your mouth goodness and so easy. Thanks for the offer! Since moving back to California, I don’t get as much good salmon as I used to in Seattle. It seems to all be farm raised which I do not care for. Since going gluten-free a few years ago, I have increasingly been eating fish and truly enjoyed it. However, I live in the Midwest where good seafood is expensive and difficult to find. Would love to try this. Thanks! My boyfriend and I both work at a restaurant that features great preparations of Midwestern freshwater fish. We don’t often get to treat ourselves to “splurge” meals like high quality fish at home though. I would love to surprise him with some Alaskan salmon. I didn’t grow up eating much seafood as a child since my parents weren’t big fans of it. However, I have discovered the wonders of salmon as an adult. If I won this contest, I promise, I would treat the salmon well. It would be loved and cared for as a good salmon should be cared for. Oh, and also eaten. It will be enjoyed. I promise. We would love to add Alaskan Gold Salmon to our a grilling selections. We try to eat as much as we can, but it is time for a change! I love salmon and all fish but sadly live in Indiana where it is hard to assess decent seafood. I would love be able to cook some delicious salmon for my family and myself! Mmmm, salmon. I love it, but find it too expensive to buy it just for myself. I would really appreciate getting to try this brand out. My now 4 year old son was diagnosed with celiac when he was 13 months old. He is a very tiny little boy, who on top of his food restrictions, is also a picky eater. I am constantly trying to find ways to put some meat on his bones. Fortunately he loves salmon. Wild salmon is a bit pricey, so winning this would be very helpful. The window of time we can buy wild salmon at Costco in Missouri is too short. This would be exciting! Your plated salmon looks delicious and I would like to know how you prepare it. I love salmon, but sadly don’t eat it often enough. Would love to try Alaska Gold Salmon caught sustainably to share with family and friends. We have been working on adding more quality fish to our diet, and this salmon sounds perfect! Would really love to win this Salmon. Thanks for the opportunity. Would love to try this fish and support this company. Im not familiar with many seafood companies in the area but would love to feed some to my 2 kids as well and start eating fish regularly. Would love to try this, but I do have one question. Are they doing routine monitoring of radiation levels? In the Midwest, it is hard to get good Salmon, especially on a limited budget. But my kids love it, and I would love to try this! Yum! I love salmon and it’s really hard to get it fresh where I live. Salmon is one of my favorite fish, but living in Minnesota, it’s hard to find decent salmon at a decent price. I was just craving some good salmon a few days ago when I was prepping some fresh asparagus for dinner! Yum! My GF daughter just arrived home from college requesting fish every night as she never gets in in the dorms. I would love to win the salmon! I’m pregnant right now and just barely starting to be able to keep things down. 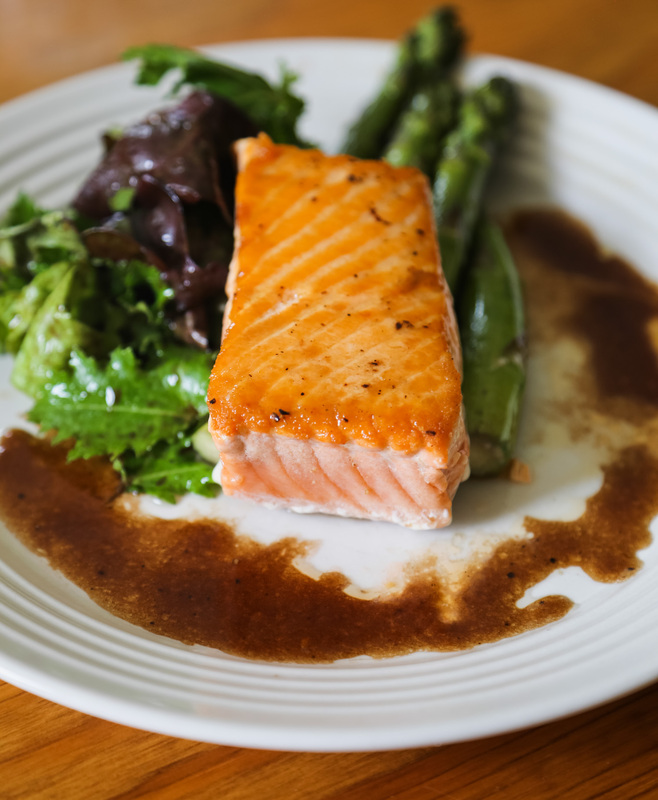 I know that I’ll need to get in my Omega-3s as soon as things take a turn for the better and salmon is the perfect way to do that. Plus, my daughter is a huge fan of salmon. Thanks for the great giveaway! Of course I would LOve to win some smoked salmon. My Grandfather lived on Vancouver Island and as a child growing up in England, I was lucky enough to visit him every summer holidays. Salmon is a big part of the Islands society and I would eat it every week if I could! Now living in Switzerland with a swiss family (my own!) means that salmon is expensive! Yes folks it is true that this little landlocked country is expensive! Anyway I love your blog.Its the only one I read weekly because its so inspiring. I recently switched to a pescetarian diet, and love salmon but rarely have it due to the cost. What a lovely treat this would be! Thanks for the chance to try it. My husband and I went on an Alaskan cruise for our honeymoon over a decade ago and what stays with us, besides the breathtaking wildlife and excellent people, is the delicious foods we ate. We consumed our weight in salmon and even sent some home to enjoy later. Would love to win salmon that we could consume without guilt. We live in the South and often avoid seafood since we cannot ensure that it was responsibly caught. I love salmon. We are trying to eat more fish in our household and this would be fantastic! All of us (me, husband, 3 kids) love salmon, and many other fishes. My 4 year old son, who is very picky about his protein, will always eat fish — it’s a staple in our household! I will look at their website and see if it makes sense for us. Thanks for sharing! I LOVE SALMON! I have been stalking my local grocery stores eagerly awaiting the yearly May arrival of Copper River salmon. My second favorite fish? Halibut. It is expensive and hard to find but sooooo good. I don’t eat meat, only seafood and so I would LOVE to try Alaska Gold seafood. Thanks for this opportunity! We love salmon in our house. My 5 year old eats it without any complaints, which is rare for him. I’d love to buy it more, but it can be expensive. It would be lovely to win. Good for mind, heart, and the soul. Joy and health, in one. our family loves salmon but we don’t eat it often due to the high cost for quality/ethics we can get behind. would love to win some! I love salmon, hard to find in the South! I love to eat salmon. The bonus is that it’s so good for you. Salmon is my all time favorite food. I think I would even rate it higher than chocolate! Would love to try the salmon myself, but I’d love giving it to my parents even more. I live in Indiana, and would love the opportunity to eat the freshest / best fish I can get my hands on. I love fish and salmon and tuna are among my favorites! Here in Ohio, our seafood choices have gotten better, but … Still. It’s Ohio. And I used to live in Tokyo. Seafood was different there. Sigh. So I’m throwing out a huge “YES PLEASEOH ME! PICK ME!” To this generous offer, because salmon is awesome and I want it always. This looks absolutely amazing, would love to give them a try! This is awesome! We just moved to Washington 6 months ago and this sounds like something that would be great for us. Thank you so much for sharing, this is a spectacular opportunity! That piece of salmon on your plate looks delicious. All of a sudden am hungry. will try the recipe. Ohhh how I miss salmon – can’t get good affordable salmon here in Wisconsin! Last weekend I made the wild salmon and morel risotto from your cookbook – oh wow, yum. I’m gluten, dairy and soy free but I don’t really like meat. I can’t quite figure out how to feed myself (and work and take care of the family) without meat since it seems I’d be working out food 24/7! So, I eat a lot of seafood. But live in a landlocked state. This is a fantastic idea and way to get fresh caught and processed seafood. Thank you! Would be nice to have a solid source of salmon here in Colorado. I checked out their website – what an amazing thing Alaska Gold fishermen are doing! One hook, one fish. Very cool. We love salmon and try to have it at least once a week. My son adores salmon. We keep a “dairy” house in the kosher sense–I’m vegetarian, but we do have some fish around for my finicky, taste/texture sensitive kiddo. Now that it’s summer, we’d put some on the grill for him and hubby, and I’d feel pretty good about it. We try to eat salmon every Friday and am very excited give these guys a try. My husband and I lived in AK many years ago and you just can’t get that great taste here in VA. Would love to have a sample once again! We are fans of salmon! I try to cook it a few times a month, but it’s difficult to find good, fresh caught fish in our area. What an opportunity, thanks for the chance to win Alaska Gold salmon, would love to give your product a try! My husband loves salmon. He only gets it occasionally when we go out to eat. Would love to surprise him. ah, why on earth *wouldn’t* i want to try this exquisite-looking fish caught using sustainable methods by members of a fishermen’s (and fisherwomen?) co-op in the gorgeous Pacific Northwest waters?? I have been looking for a source for good quality salmon that uses sustainable fishing practices. I would love to give Alaska Gold salmon a try. It sounds great! If I won some coho I would smoke it whole! Salmon is my favorite, enough said! ? I love that this is sustainably caught seafood and from fresh, clean waters.